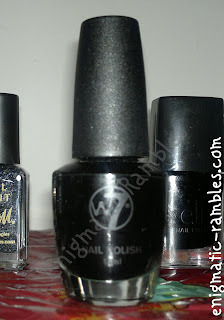 Not sure this introduction is really needed but I am doing a series of posts to find out which polishes are the best in my 'collection' as of 2012. 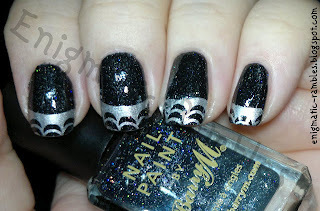 This as the title suggests is BATTLE OF THE BLACK, I am actually suprised at how few black polishes I have. I really struggled to choose my favorite polish from the bunch. 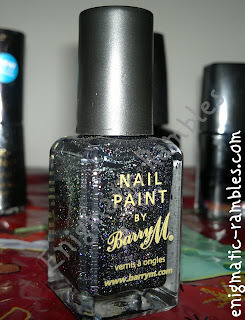 The Barry M is really nice, good formula and has a stunning holo packed in there. Then we have W7 Black which is a really good coverage polish, as a bonus it is amazing for stamping as well as straight polishing. Which is why I am putting both through in to the next round.